Junior Girl Scouts with their bird feeders made from up-cycled materials. 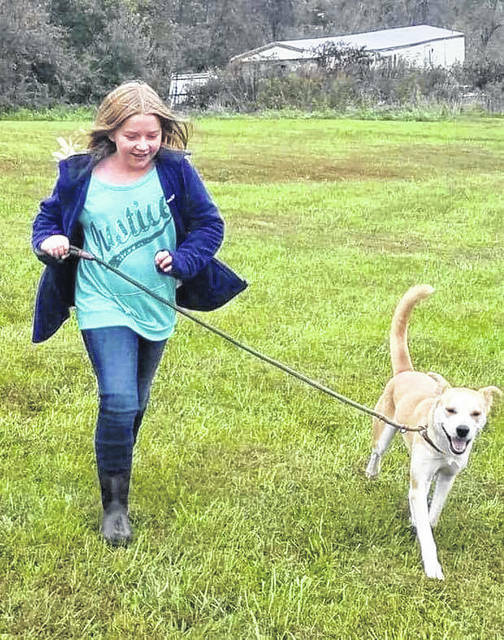 A troop member walking a dog during the troop’s trip to the Gallipolis Humane Society. A group picture of members from Girl Scout Troop 51438. POINT PLEASANT — Earlier this month, one of the sweetest seasons of them all kicked off, Girl Scout cookie season. Girl Scout Troop 51438 Leader Julie Boggs shared cookie season kicked off on Jan. 4. The girls will be accepting paper pre-orders until Feb. 1, with the cookies coming in towards the end of February, beginning of March. At that time, the girls will deliver the pre-ordered cookies and after all of those orders are handed out, then the girls will start setting up their cookie selling booths around the city of Point Pleasant on Saturdays. Last year a business even let the girls set up a drive thru to sell their cookies. Boggs is planning to ask a business to do this again. 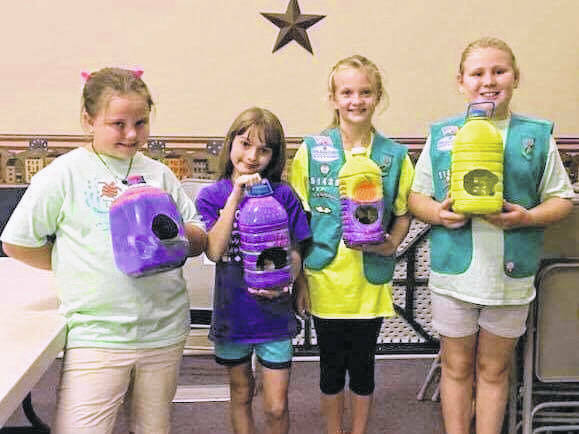 The funds from the cookie sales help the troop leaders and girls purchase supplies for their meetings such as their badges and supplies for crafts. Last year, the girls used their cookie money, along with additional donated funds, to make food and supply baskets to give out to individuals at the Kitchen of Blessing in Henderson. Troop 51438 is one of three girl scout troops in Mason County. 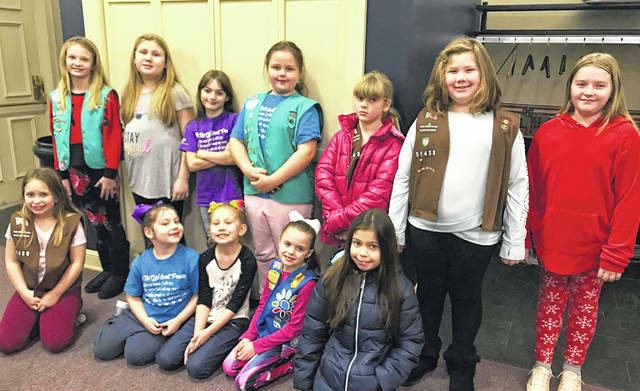 Troop 51438 includes girls from Beale Elementary, Roosevelt Elementary, Point Pleasant Primary School, and Point Pleasant Intermediate School. There is also a Point Pleasant troop and a New Haven troop. Troop 51438 meets the first and third Friday of each month at the Mason County Library at 6 p.m. Girl Scout season begins when school starts and the girls are classified in different groups such as Daisies, Brownies, and Juniors based on their school grade. Every two years the girls bridge to another level in the troop. A girl can join Girl Scouts in any grade ranging from kindergarten-12th grade. Boggs shared girls who are interested in joining can have their parents go online to the Black Diamond Council and register them. During Girl Scout season, the girls participate in their meetings in which they do crafts and work toward earning that month’s badge. This month, the girls of Troop 51438 are working towards earning their Mountain Momma badge, which is recognizing women of Appalachia. Each month of the year, the girls focus and learn about a new and different female image to earn a badge. One meeting of the month is dedicated to the female the girls had been focusing their attention on for the month. The girls also participate in community service projects throughout the year, Boggs shared Troop 51438 have volunteered their time at the Gallipolis Humane Society and during Christmas this year they donated toys to the Keefer Family Toy Drive, so they could be delivered to the children in the pediatric unit at Cabell Huntington Hospital. Also, girls with a shy nature can benefit from joining the girl scouts, this experience provides a way for girls to come out of their shells and learn how to communicate with people. The girls learn a lot during their years in the scouts and make new friends from different schools, expanding their boundaries.